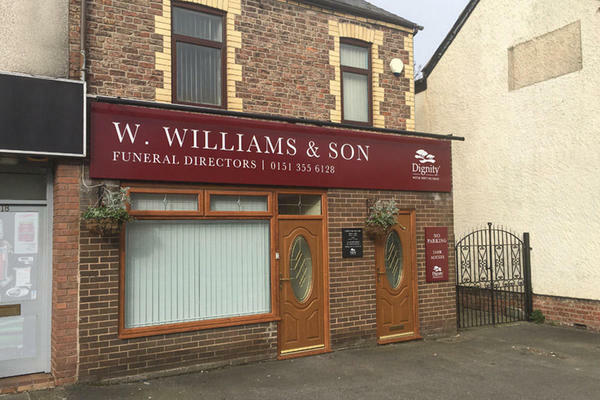 On the outskirts of Chester and in the heart of Ellesmere Port, W Williams & Son Funeral Directors have been providing the local communities with an outstanding standard of funeral care since the 1870s. Dating all the way back to our founder, William Williams, our team have always grown up and lived in Cheshire, with strong ties and a wealth of knowledge of the community they love. We understand the community, which is why it’s important to us to give an unparalleled quality of service without compromise. It’s our duty to treat your loved one with compassion, respect and the dignity they deserve. We can create all times of funerals, whether you would like something traditional or a colourful celebration of life. We are with you every step of the way during this difficult time, which is why we offer 24 hour support and guidance from our dedicated compassionate team. Please give us a call without hesitation so we can help. There is car parking available opposite the funeral home. We are located a few shops down from Morrisons in Whitby. Our staff are available 24 hours a day on 0151 355 6128 if you require our services outside of these hours.